Whether an actor or a simple backdrop, the Alps are a key feature in many films, documentaries and fictional stories. The site for both psychological dramas and Hollywood action films, occasionally realistic, sometimes poetic or symbolic, the mountains have for over a century contributed to the magic of movies. A pioneer in film making, Félix Mesguich earned a spot in the history of mountain cinema with a short film in 1905. An operator for the Lumière brothers, he travelled the world with his movie camera and recounted his adventures in a book (Tours de manivelle, Grasset, 1933), in which a chapter covers his first Alpine film-making efforts. Excerpts. Moving or funny, spectacular or sober, vulgar or straight-laced, they play on the many facets of our imagination. 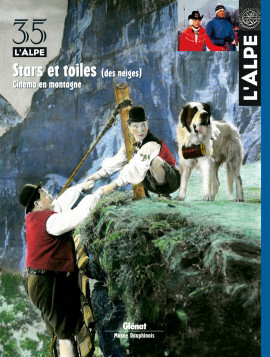 Accompanied by a mass of publications ranging from advertising brochures to photo-stories, posters clearly display the changes in our perception of the Alps over a century of film-making history. The Bergfilm, an essentially German film genre very popular in the 1920s, is based on a conservative or even nationalistic ideology. At the foot of the mountains with the immaculate white summits, where superior effort brings salvation, all the symbols of evil spring forth to illustrate the corruption of the valleys compared to the purity of the higher altitudes. U.S. directors have a paradoxical relation with the Alps. Though seduced by the landscapes, they generally have no feel for mountains themselves. With very few exceptions, the Alpine environment remains simply a backdrop for major productions and rarely participate in the scenario. A short review of the best and the worst. The Indian directors of films made in Bo(mbay)llywood have found that the Alps constitute the ideal set. Saris and turbans now fit in perfectly with Swiss chalets and Tyrolean glaciers, providing an exotic touch and moments of fantasy for millions of viewers. Can the mountain become one of the characters in a fictional story ? An indispensable presence that impacts on the action and the emotions ? Here is an array of situations, from bridal veils to glamorous furs, festive settings, serial killers and the shrouds of death. A short flash-back, neither complete nor selective, on the various roles. James Bond always remained faithful to the mountains. Whether as a magnificent set or an (almost) dangerous playground, they served as a frigid reflection of the changing features in our society. Following the recent release of Casino Royale, a zoom on the spy who loved the summits. … that advertising has made the Alps one of its favourite settings. Glorified, exploited, abused, mountains concentrate the best and the worst in communication. A trip through a few decades of slogans that became world famous (including Ovomaltine) or were completely forgotten. Silence… Camera… No particular knowledge on movie-making techniques is required to guess that shooting a film in the mountains is not necessarily the easiest of situations. Summit meetings. Even more than fiction, documentaries and family films constitute a very fragile memory. After finally awakening to this fact, a few institutions have started to systematically collect these Alpine archives. Then arises the question of how to save them and make them available to the public. This exhibition in the Fine-arts museum in Zurich ( Switzerland) deals with the Alps in the eyes of scientists, artists and travellers. A subject constantly revisited, yet intelligently presented here, with surprising works by Winston Churchill, Jean-Luc Godard, Jacques-Henri Lartigue and many others. Seen from the sea, high points are of major importance for navigators. In step with exploration, map makers attempted to represent the mountains rising up beyond the sinuous coast lines, thus making them a feature in the adventure of marine charts. A novel facet uncovered here by Olivier Le Carrer, the author of the splendid Océans de papier, recently published by Glénat. Visual arts, photography, music, cinema, literature, theater and dance are all part of a vast exchange program between Switzerland and the Rhône-Alpes region that will be launched in January in Lyons and will continue throughout the year. An occasion to note that the Swiss arts include a number of internationally known figures.